CARACAS, Venezuela (AP) - Even as Venezuelans fill the streets rallying behind opposition leader Juan Guaido and the list of foreign nations recognizing him as the country's rightful president grows, the top members of the all-important military are sending a different message: Forget about it. Since taking the helm of Venezuela's government in 2013, Maduro - a protege of the late socialist leader Hugo Chavez but with no military experience himself - has cemented the support of the nation's troops by promoting loyalists, giving them control over key sectors of the economy and appointing them to ministerial positions. 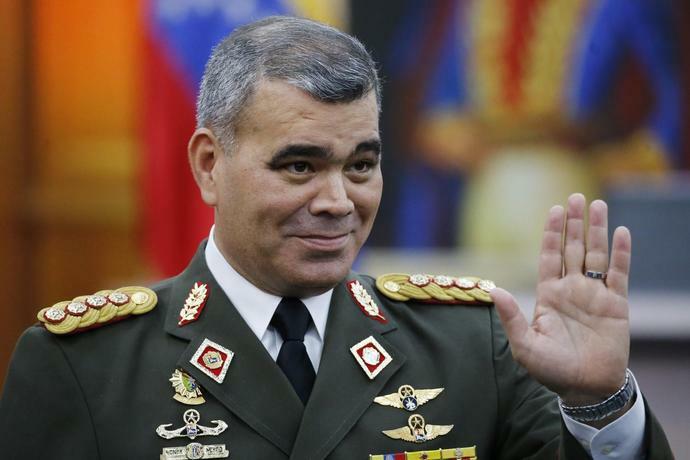 All that means that the military's top brass remains beholden to Maduro and is likely too frightened of losing its standing or going to jail to betray him, according to experts on Venezuela's military. 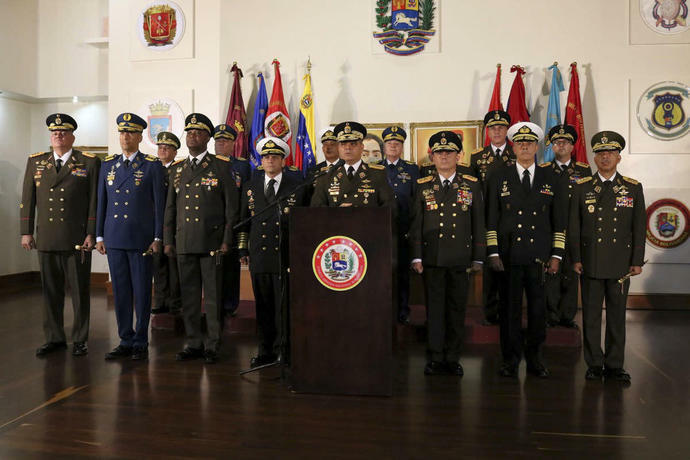 Rank-and-file troops struggling to put food on the table may not share their steadfast loyalty, but the odds of a significant faction defecting and recognizing Guaido are slim, several current and former military officers said. "We have to wait and see what happens over the next 48 hours," said Jose Antonio Colina, a former army lieutenant. "If the middle- and low-ranking troops don't express their disagreement within the next two days, we can assume they're standing by their leadership." The armed forces have traditionally served as an arbiter of political disputes, though according to the constitution backed by Chavez they are "not at the service of any person or political partisanship." Exactly 61 years before Guaido pledged before swarms of supporters to serve as Venezuela's interim president, the military ousted dictator Marco Perez Jimenez, who fled on a plane to the Dominican Republic amid mounting unrest. Chavez as a young army commander staged a botched coup in 1992 and a decade later was briefly forced from power himself. But the military he's asking for support from is far different than that of the past; Chavez and now Maduro have blurred once-clear lines of separation between troops, the government and the ruling political party. In that environment, it becomes highly unlikely that a fracture among the top leadership would occur, though there are signs of cracks amid rank-and-file troops. Perhaps curiously, the military has not activated the emergency protocol known as "Plan Zamora" that has been used during previous unrest and gives troops authority to repress and control mass demonstration. One former general who spoke on condition of anonymity said that might be acknowledgement that disillusioned underlings wouldn't follow those orders. On Thursday, one 19-year-old member of the National Guard, still with braces on his teeth, said he wouldn't want to be in the position of having to beat protesters. Speaking on condition of anonymity for fear of reprisal, he said he'd be outraged to apprehend "innocent people." Another young comrade patrolling a busy road leading to the Supreme Court with the teen said he hadn't seen the video images of military leaders proclaiming their support to Maduro because he doesn't own a cellphone but that he follows orders as instructed. Colina, the former army lieutenant, said even though many rank-and-file troops are going hungry like countless other Venezuelans, they don't have effective leadership to challenge superiors, meaning it's likely they'll opt for the status quo. "It's not enough, unfortunately," he said. "They've stopped being the moral compass." Several former military leaders who remain in close contact with active troops said that for Guaido to even have a chance of winning over support from sectors of the military, he'd have to continue to galvanize the public and prove to skeptical military officers with much to lose that his promise of granting amnesty to those who promote change is sincere. "What's going on in Venezuela," San Miguel said, "hasn't finished yet."